This course serves as an introduction to linear algebra which is the study of vector spaces and their linear transformations. Although they are defined by just a few simple rules vector spaces and linear transformations have found wide-ranging and profound applications in mathematics, physics, engineering, economics and many other areas. For instance, we all know how important the derivative of a functions are, but after this class you will be able to see that a derivative is nothing more than a linear transformation between two vector spaces. You will also be in a bette rposition to understand some of the ideas behind Google's page-ranking algorithm. In this course we will examine vector spaces in the "pristine" world of abstract mathematics. By taking an abstract view of vector spaces we will hone your ability to recognize, analyze and manipulate vector spaces as they arise in "the wild" and we will improve your ability to think like a mathematician. Prerequisites: A keen interest in learning how to think in a mathematically rigorous and abstract manner, as well as a willingness to meet during x-hours. Completion of math 11/12/13/14 also wouldn't hurt. If you are unsure about your preparation for Math 24 or if the difference between Math 22 & Math 24 is not clear to you, please speak with me as soon as possible. 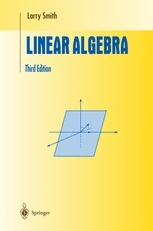 Textbook: Linear Algebra (Third Edition), Larry S. Smith, Springer 1998. (available at Wheelock Books). Tentative Syllabus: This syllabus is subject to change, but it should give you a rough idea of the topics we will cover this term. Check blackboard for up-to-date information. (tentative) Deliverables & (tentative) Grading Guide: The following will probably comprise the written assignemtns for this term. Weekly Group Homework: Your assignments should be written neatly and you should present your proofs and solutions using complete sentences. You are encouraged to collaborate with other memebers of the class, but your final write-up must reflect your understanding of the material and you must acknowledge people with whom you consulted. No late homework will be accepted. Your course grade will probably be computed as follows. Students with disabilities: If you have a disability and require disability related accomodations please speak to me and Ward Newmeyer, Director of Student Accessibility Services, as soon as possible so we can find a remedy.